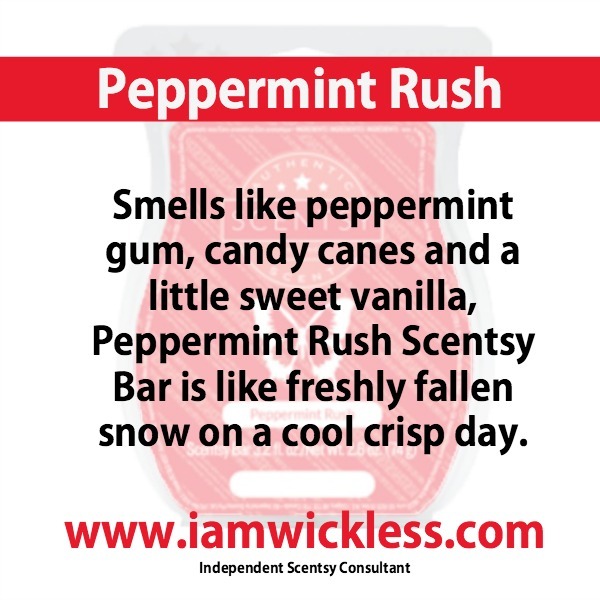 Smells like peppermint gum, candy canes and a little sweet vanilla, Peppermint Rush Scentsy Bar is freshly fallen snow on a cool crisp day. Peppermint Rush Scentsy Bar refill is available online and offers notes of peppermint and vanilla, like a field of fresh fallen snow. Add 4-5 cubes of Peppermint Rush candle wax cubes to your favorite Scentsy wickless candle warmer and breathe in cool, refreshing holiday fun. Scentsy Bars have a very low melting point and are best experienced when used in an electric Scentsy Warmer. With over 90 long lasting fragrances, including our Peppermint Rush Scentsy Bar refill, there’s sure to be a favorite for everyone. Each Scentsy bar is scored to easily break into 8 cubes, and contains 3.2 fl. oz. Would you like to take advantage of our Scentsy Bar refill savings? Scentsy offers a discount bundle, buy 5 Scentsy Bar refills, and get one Scentsy Bar for FREE! You choose which Scentsy Bars you would like to add to your bundle. ($6 savings!). With Scentsy direct shipping, it’s always easy to have you Scentsy Bars and products direct shipped to right to your door.